By virtue of her Immaculate Conception the Blessed Virgin Mary was free from original sin from the very moment of her conception in the womb of her mother, Saint Anne. We celebrate the birth of the Blessed Virgin Mary on September 8. Nine months before is the Feast of the Immaculate Conception, celebrated on December 8. 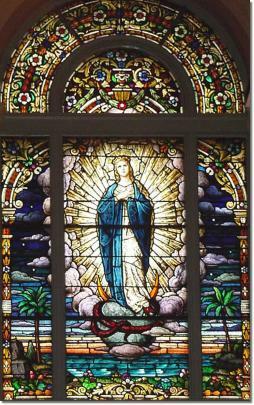 By virtue of her Immaculate Conception, Mary's body, free from any stain of sin, does not corrupt in the grave. She was restored to life and assumed body and soul into heaven. This was the work of Jesus, obeying the 4th Commandment, honoring His Mother.